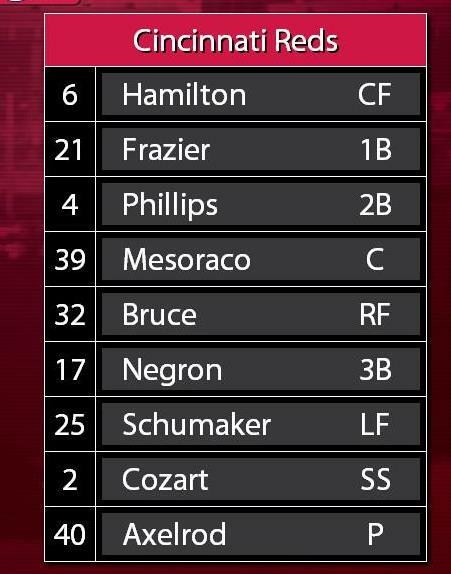 Here's the Reds lineup. Very early even for a 12:35 game. This is not on FSO. It only on WGN and the MLB Network. Sitting in the Fox Sports Ohio suite today. Really nice experience. K... Where is that? I'm out in left field. BTW spotted a Cubs' fan w/a Rizzo t-shirt. Section 114. 3rd base coach is on a direct line in front of me. This may be the best lineup I have seen in well over a decade. Dylan Axelrod is lights out. The Cubs should just forfeit! I know someone already said this... But Coghlan is a pain... That was 11 pitches. Billy walks and steals base #51. Marty pointing out the right way and the wrong way to play baseball. I wonder if he would like it if we did that with his broadcasting? Marty pining on why all the Reds batters can't be 100% successful in advancing baserunners to third. Reds leave runners stranded at 1st and 2nd to end the first. We are just zipping right along here. Axelrod throwing a million pitches again this inning. Two out and a runner on 2nd for the Cubs.